Growing up in the tranquil, rural community of Findlay, Ohio, Andrea Levy quickly learned that life wasn’t always peaceful. At one point, her brother was serving in Vietnam, while her sister attended Ohio University during heated anti-war protests that temporarily shut down the university. Her other brother found ways to cause trouble as only young boys can, so the youngest of four figured out a solution. Andrea left Finley to attend Ohio University, where she earned her BFA in 1982. She had immersed herself in abstract painting, but upon graduation, tossed all but one of her canvases into the dumpster. She was about to embark on a 17-year odyssey around the US, living in numerous cities, including Olathe, KS, El Paso, TX, Seattle, WA, and Phoenix, AZ, before moving to Cleveland and accepting her current position at Cleveland’s only daily paper in 1999. Since then, she’s achieved her goal of elevating the imagery in the newspaper to fine art on a daily basis. “Andrea has the ability to take newsprint and thin paper and make it feel like it’s a thick canvas with rich images that are very layered and have great depth,” observes her close friend Rob Chwast, PhD, a clinical psychologist in Cleveland. 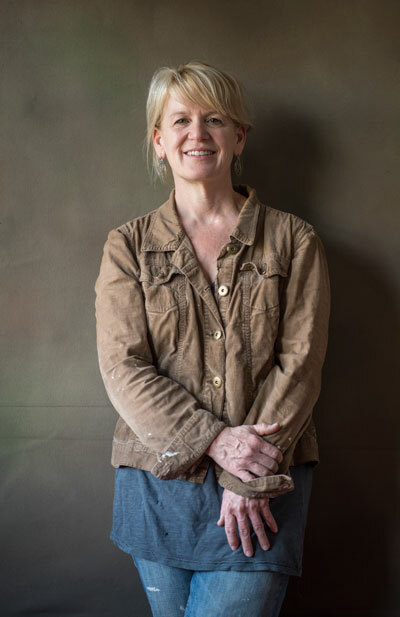 In fact, her work has garnered numerous regional and national awards, including first, second and third place finishes for illustration from the National Press Photographers Association, a Sigma Delta Chi Award from the National Society of Professional Journalists, an Emmy last year for a commercial she co-produced about the survival of print publications, and National Headliner Awards for the past ten consecutive years. Her freelance client list includes ADWEEK , The Boston Globe, The New York Times, The Wall Street Journal, The Washington Post, and the Village Voice. Andrea’s images are always distinct, ranging from whimsical to hauntingly unforgettable, such as her illustration entitled “9-11 Remembrance” for the ten-year anniversary. “After a couple of months of thinking, pages of notes, a lot of sketches, and hours of soul-searching, I ended up with the simplest of images,” she wrote about the piece. “I dipped my own hands in a can of black paint and wiped them down the back of a piece of cardboard in my studio.” Between the two hands reaching toward the sky she drew a tiny figure falling, elegantly signifying the far-reaching human toll suffered that day. Robert Newman of Robert Newman Design named it his favorite illustration of 2011, and Steve Dorsey, president of the Society of News Design, proclaimed it: “Evocative and gripping. Recaptures the horror of the day so beautifully and simply. Bravo.” Earlier this year, she received a Community Partnership of the Arts Fellow award, which has given her a little extra freedom from bills to explore abstract painting once again. She hopes to assemble an exhibition of her work soon. Throughout her life, ever since those days drawing in the sanctuary of a quiet room at home, Andrea has relied on art as a way to steer clear of chaos.